Tracks to a typical course in operations management or operations strategy, and covers topics such as evaluating and measuring existing systems' performance and efficiency, materials management and product development, using tools like Six Sigma and Lean production, designing new, improved processes, and defining, planning, and controlling costs of projects. 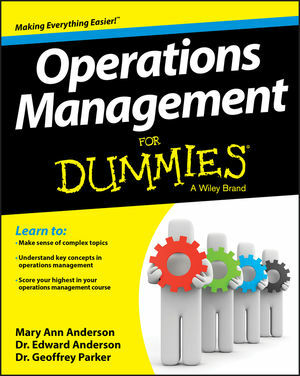 Whether your aim is to earn an undergraduate degree in business or an MBA, Operations Management For Dummies is indispensable supplemental reading for your operations management course. Mary Ann Anderson is a consultant in supply chain management and operations strategy. Dr. Edward Anderson is Associate Professor of Operations Management at the University of Texas McCombs School of Business. Dr. Geoffrey Parker is Professor of Management Science at the A. B. Freeman School of Business at Tulane University.